Syllabus of the Online Course (Subject): United Nations Economic and Social Commission for Western Asia (ESCWA). Learning materials in or Comisión Económica y Social Asia Occidental Commission économique Asie Ouest. The United Nations Economic and Social Commission for Western Asia (ESCWA) is the regional body of the United Nations for Western Asia. 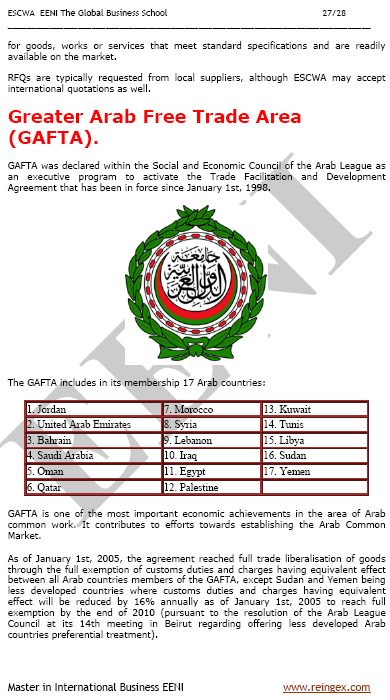 The member states of the Economic and Social Commission for Western Asia are Bahrain, the Arab Republic of Egypt, Iraq, Jordan, Kuwait, Lebanon, Libya, Morocco, Oman, Palestine, Qatar, Saudi Arabia, Sudan, Syria, Tunisia, the United Arab Emirates, and Yemen. The United Nations Economic and Social Commission for Western Asia (ESCWA) is a framework for sectoral policies conception and coordination in the Western Asian economies. The production sectors in the region of the Economic and Social Commission for Western Asia suffer from low productivity and poor competitiveness, which can largely be attributed to the inefficient use of resources, insufficient creation of “networking” and misuse technology. The small and medium-sized enterprises, which are among the main employment and income sources, are the most vulnerable groups to these challenges. 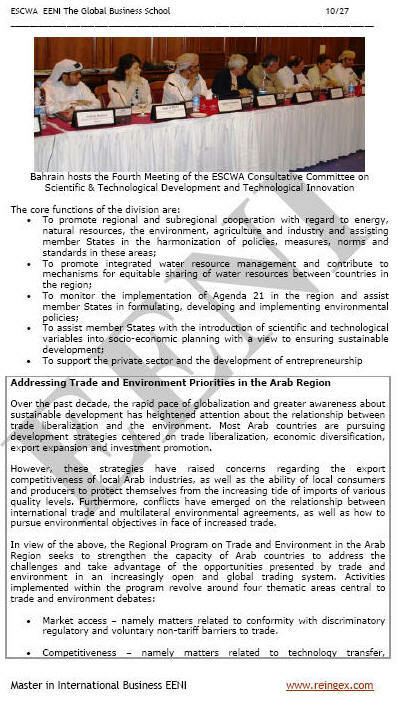 The Economic and Social Commission for Western Asia (ESCWA) cooperate with other regional bodies like the Arab League, Organisation of Islamic Cooperation) or Cooperation Council for the Arab States of the Gulf (لمجلس التعاون لدول الخليج العربية). The Economic and Social Commission for Western Asia (ESCWA) belongs to Islamic Civilisation and African Civilisation.